The Pope’s name is like a campaign promise. It announces to the world who they are, and what they will do during their tenure as the head of the Catholic church. For a Pope to choose the name of St. Francis of Assisi is actually quite a radical message to send to the church. Central to the life of St. Francis is a lifestyle of poverty and a love for all of God’s creation, and this is what marks the life and message of Pope Francis. The film is not just a Vatican puff piece on the Pope, but a delineation of his calling for the entire church to follow Christ more faithfully in the world, and for the world and its systems to work together for the good of all people. Pope Francis: A Man of His Word is a must-see if you are skeptical about the Catholic church, especially if you are a Protestant Christian. One critic said that the Pope “is not reforming the church but denaturing it, reducing it to a social tool.” Sadly, they’ve missed the mark entirely. It is not a truncated version of the gospel that Pope Francis is preaching, but the gospel applied. Contrary to what media pundits have reported, he is not a liberal ideologue but one gently calling out in the wilderness for people to emulate the life of Christ all areas of life. The film begins with a reflection on the nature of time and the cycles of human history, before introducing us to the story of Saint Francis of Assisi’s calling by God to embrace poverty as a way of life. As the title of the documentary suggests, Wenders wants to show people that Pope Francis’ life doesn’t contradict what he says. This message is crucial for the Western church, which has recently been rocked by scandals in church leadership. 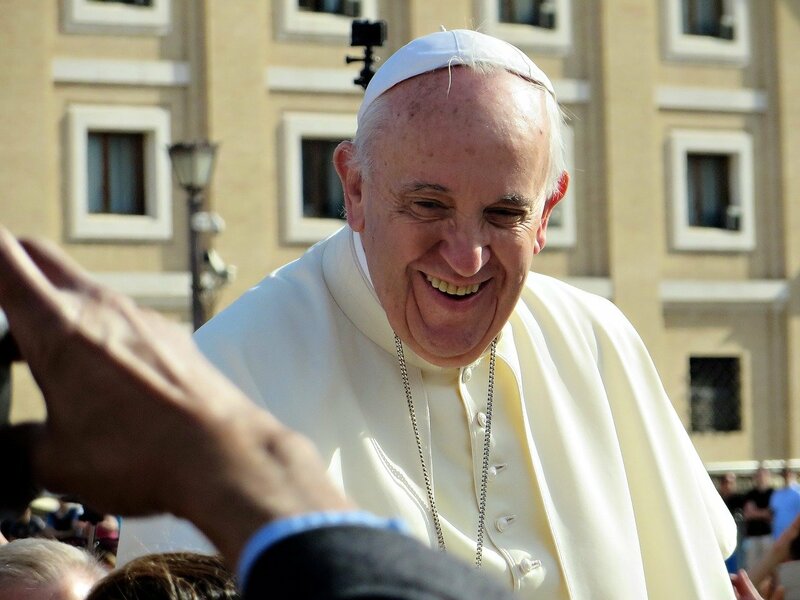 Now that terms like ‘post-truth” have become frighteningly commonplace in society, it is a blessing to see the life of an influential church leader like the Pope uphold the integrity of the message they preach. Christ calls his followers to take up their cross and follow him, and Wenders wants to show people a leader that carries his cross with integrity, not for his own glory but as an invitation for others to do the same. Wenders’ footage of the Pope shows him traveling around the world while addressing several relevant subjects in the 21st century like climate change, interfaith dialogue, materialism, and economic inequality. In some cases, he is recorded speaking directly to the camera, which communicates a clear desire to speak to his audience. We see in several instances that he is not standing high above the masses, but stepping down to be with the people. The Pope is challenging faithful Christians not to keep their faith cordoned off safely behind doctrine and polity, but to engage the real world around them. In the film’s most powerful scene Pope Francis condemns the Roman Catholic church’s past leniency towards Catholic priests who had been accused of the sexual abuse of minors. Lacking the amiable expression that normally adorns his face, he states that refusing to remove priests that have been convicted of sexual abuse cripples the witness of Christ to youth and to the world. There must be a zero-tolerance response by church leadership. To preach Christ in his entirety, all who claim to be his followers must live with appropriate measures of charity and a hardline pursuit of justice. Of course, this doesn’t mean that we have to unquestioningly follow the teaching of Pope Francis. Everything he says should rightly be filtered through the authority of Scripture and the faith we have inherited through Church tradition. However, his message is a serious challenge for the sometimes stodgy intellectualism and arrogant, defensive spirit that is, with good reason, attributed to Protestantism. Both Conservatives and Protestants share a common instinct to preserve the doctrinal foundation of their systems. This is vital for the life of the church to flourish, but it becomes unhealthy when it chokes out opportunities to be involved in real-world issues. When Pope Francis speaks, those outside the Catholic church should not hear a subversive threat to the institution of the church, but an invitation to boldly engage the world with the healing love and the values of Jesus Christ. If our faith is real, it must quietly unfurl its wings and leave the safe nest of our minds. In a broken world that tends to make us uncomfortable, afraid and, if we’re honest, unloving, we must fully integrate our faith and our actions. Jesus himself was the life of God in the world, and he was unafraid to touch the hardest and darkest parts of life. As his followers, we should do the same.